Located just 3 miles north of downtown Bozeman, Montana, Cherry Creek Guest House is an eclectic 4 bed/3 bath home featuring a spaciously comfortable interior, incredible mountain views and beautiful yard with hot tub and fire pit. With a view to the East Gallatin River and hundreds of acres of open space out back, you'll feel as though you are in the Montana wilderness while abundant shopping, fine dining, recreation and entertainment options are just around the corner. Originally built in 1956 with a stunning renovation, this 3200 square foot ranch home offers truly memorable lodging. Upon arrival you will find a large wooden carport adjacent to the home's entrance which provides both convenience and privacy. From the artistic slate and Douglas fir timber flooring to the vaulted ceilings with reclaimed wood beams and expansive picture windows to the mountainous view beyond, this space is something everyone should experience. 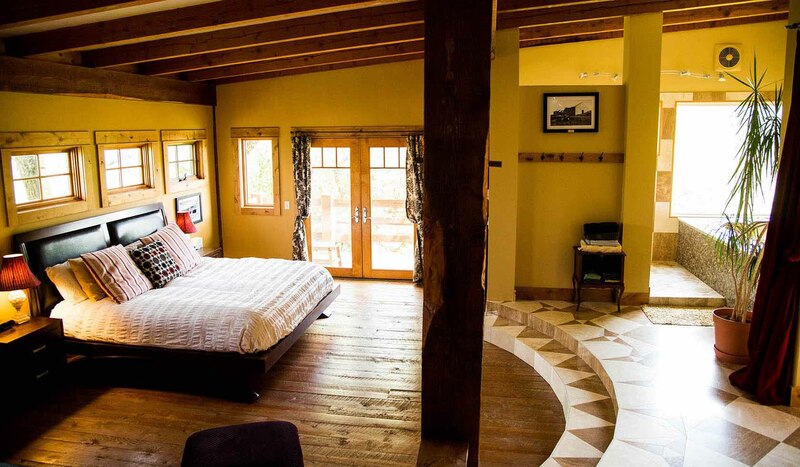 Bedrooms and Baths: The home accommodates up to 8 people with 4 bedrooms and 3 bathrooms. The upper level is dedicated to the master suite with 2 exterior decks viewing the Bridger range of the Rocky Mountains. This suite also features incredible marble floors into the luxurious bathroom with a custom built-in jetted tub, an expansive walk-in shower, king size bed, TV and DVD player. The main level features 2 bedrooms and 2 bathrooms, one with a large walk in shower and the other with a bathtub. Off the sunken living room is a third bedroom, with a king size bed, TV and DVD player. Kitchen and Dining: The retro kitchen is fully stocked with everything needed for vacation cooking. In addition to dishes, utensils and cookware, you'll find the necessary large appliances and coffee maker, crock pot and blender. A washer and dryer are adjacent to the kitchen for convenient laundry access. The dining room table will seat 8 comfortably with a spectacular view and there is ample outdoor seating as well. The gas barbecue grill is located out the back for outdoor cooking. Living: The home has two separate living spaces including a cozy sitting area by the wood fireplace and a sunken living room with large screen TV and DVD player, huge picture windows and glass doors looking out to the yard and mountains. (Note: The home has three TVs, each with a DVD player. There is no TV reception but there is a DVD library along with games and books.) Special Note: The train that goes through the valley passes within view and earshot of the home. It's about 1/10 mile away to the south. It is audible so bring ear plugs if you are a light sleeper. A little piece of history in 1806, William Clark and Sacajawea passed by this property via the East Gallatin River when returning to St. Louis after their journey through the rugged west. They rejoined Meriwether Lewis at the confluence of the Missouri and Yellowstone Rivers.